This episode of “Days of Our Nine Lives” is dedicated to profiling the cast of characters. 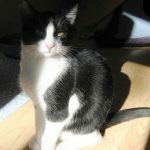 Pepper: Pepper, one of four tuxedo cats in the ARF cattery, has learned to love humans, but she lets them know that she will come to them; they just need to be patient. Pepper is 5 years old and really loves to find the highest point in the cattery so that she may keep track of all that is happening. Sadie: Tuxedo Sadie has come a long way in her five years with ARF. Sadie came in with Carli when they were young. They didn’t know what to think of humans and weren’t too excited about interacting. While Carli remains pretty shy, Sadie has come out of her shell. A patient human who takes a seat in the ARF cattery will be pleasantly surprised at how friendly Sadie truly is. 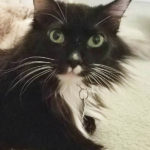 Tinkerbell: Tinkerbell is the fourth ARF tuxedo, but she stands out from the other three because her locks are long and flowing. Tink has become the unofficial greeter in the cattery, meeting visitors at the door and waiting for loving attention. She has eyes the size of saucers, and she doesn’t hesitate to cast a spell with her longing gaze. 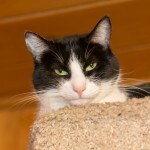 Tink is a very friendly, outgoing girl whose forever mom had to give her up upon entering hospice. All 10 ARF cats are very eager to find forever homes of their own. They hope caring humans will visit them, planning to spend a little time in the cattery. They have so much to offer, but learning who they really are takes a little time. And please stop in to say hello to the entire adoptable cast at the ARF House, 26890 Hwy. 243 on Saturdays 10-4 and Sundays 10-2, or by appointment M-F by calling 951-659-1122.